I have sometimes given money to beggars. On cold autumn days, when a homeless man has seemed to be in need of some money to buy food or a cup of coffee, I have occasionally dropped him a few coins. Those coins, I have thought, mean much more to him than they do to me, and giving is a nice thing to do. Upon reflection, however, I have come to change my mind, and now I don’t give money to beggars. Let me explain why. On the one hand, there are the traditional, somewhat cynical, arguments that—in spite of their cynicism—carry some weight. First, for every dollar that we give to a beggar, the more lucrative we make begging and, comparatively, the less lucrative we make working. This is bad, for we want people to work, not beg. Working is productive; begging is at best neutral and often a burden and a nuisance. Second, there is no guarantee that the beggar who receives the money will spend it in ways that increase the quality of his life. He might well spend the money on alcohol or drugs, and end up financing organized crime. These objections carry some weight, but they are not decisive. What is decisive is the fact that if you give money to beggars, you almost certainly spend your welfare budget helping the wrong people. First of all, you are likely to give your money to the beggars who already get the most from other givers. Depending on their location, their looks, and what they say, different beggars have different degrees of success in how much money they attract. Like everyone else, you are statistically likely to give the most money to the ones with the locations, looks, and tricks that prompt people to give. A few weeks ago, I stopped and observed a beggar who looked quite a bit like Mother Theresa. She had a small picture of Jesus in front of her. When people walked past, she bowed her head, folded her hands, prayed, and made sure to mention “Jesus Christ” in her prayer. About one in six gave her money. If the average giver gave her 50 cents, and 10-15 people passed her every minute, she got 50 to 70 dollars per hour. If you give money to beggars on impulse, chances are that you end up giving to the Mother Theresa look-alikes (and their equivalents), not to the poor men and women whose appearances have less power to elicit sympathy and guilt in passers by and who occupy less favorable spots in the city. Even if you follow a well thought out strategy to eliminate this problem, however, you are still almost certainly giving your money to the wrong people. The reason why is that, presumably, you live in the developed world—and so do the beggars that you walk past on the street. The vast majority of beggars living in the developed world, moreover, have a quality of life that millions in the developing world can only dream of. When I went to elementary school, I remember that I was very moved by Ralph McTell’s song “Streets of London”. The song tells a sad story about some of London’s poorest, and follows one old man in particular. The story is heartbreaking. Not long ago, however, when I heard the song on the radio, it struck me that the man in McTell’s song does not live that horrible a life after all. Judging from the lyrics, the man has shoes, he has access to a newspaper (albeit yesterday’s), he sits in a café, and he orders tea. In a world where thousands die of malnutrition every day, that’s a pretty comfortable life. The thousands who die of malnutrition are important to keep in mind, for every single dollar that we spend on helping others can only be spent once. A dollar given to a beggar is a dollar not given to a starving child in Sub-Saharan Africa. So why should you prioritize the beggar in the Western world over the starving child in Africa? It might be harsh to claim that it is immoral to give the money to Western beggars. After all, it seems reasonable that you can spend the money on yourself, and as such, it seems that it is your privilege to spend the money as you like. True as that might be, it is also true that you waste your money if you give it to a beggar. Even if we bracket the question of what portion of our money we should spend on ourselves and what portion of our money we should spend helping others, we should spend our money wisely. If our aim is to benefit ourselves, then giving money to beggars is suboptimal. If our aim is to benefit others, then giving money to beggars is also suboptimal. Either way, giving money to beggars is wasteful. In seeking to help others, we should not merely give to those who are geographically close to us and whose appearance elicits our sympathy. Rather, we should give to those who are the worst off, who can be helped the most with each dollar that we give, and who are the least responsible for the situation that they’re in. To achieve this, we should (i) consciously decide how much of our money we are willing to spend on helping others, (ii) find the most efficient charity, (iii) donate money to that charity, and (iv) say no the next time a beggar asks if we can spare a dime. Because the beggar is part of my community, and the starving child is not. Your claim depends on the idea that duties of beneficence are not functions of proximity. I don’t think this is a very sensible way to think – I don’t see why I owe as much to someone in a remote community from whom I am completely disconnected as I do to someone who lives in the next street. If I have repeated interactions with someone it seems to me that I owe them something like duties of kindness/beneficence pretty much in proportion to the level of interaction. It makes no sense to me to owe as much consideration to people with whom I have had zero contact as I do to actual people with whom I’m interacting all the time (ie people in my community). What does this mean? Most of the beggars do not live next street, but travel as professionals thousands of miles, from Romania or the Balkan for example. Are they part of your community being europeans – and the starving child being african is not? Does your beggar still bear the white man’s burden? “What does this mean? Most of the beggars do not live next street, but travel as professionals thousands of miles, from Romania or the Balkan for example. I’d be seriously impressed if the beggars in my community (Wellington, New Zealand) came as professionals from the Balkans or Romania. What I mean by “part of my community” is that the beggars I’ve seen in the US, NZ, and the UK were locals – fellow citizens, at least. Most of them are resident in the same city, which makes them more proximate still. Even if they were from part of a supra-national community like Europe, that would still make them closer to me, socially, than someone from a very distant part of the world. My claim is that I don’t see why I should ignore these flavours of social proximity. I understand that the social-economical standards in New Zealand are similar to Europe. David Frame is right: very seldom a Romanian professional beggar will reach Wellington. And empathy in Wellington has problems to reach a starving child in Africa. P.S. As german tv-journalist I worked and lived with proud gipsies in Spain and Romania. They laughed about being called “Sinti and Roma” now in Germany. I didn’t mention them in my previous text, nor did I generalize. Ever heared about projections? Juergen: My point is not that one should not give to starving people on the other side of the world. My point was that I do not believe the original poster’s claim that the obligation to donate to people in absolute poverty a long way from you trumps obligations to help people in relative poverty closer to you, since I think social context matters: if I don’t help the beggar, who will? Certainly not the billionaire philanthropist, who will be just as focussed on bottom lines and returns on investment as 80k hours are. Thanks for answering again, Dave. I still have problems with your “proximate” thing. I never took that geographically by the way. 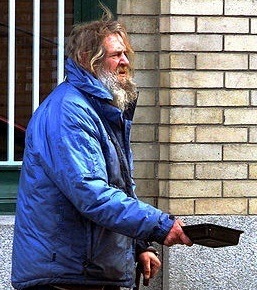 Giving your dime to the beggar from next street in Wellington looks o.k. to me, as long as you are aware that it is more important for you than for him. I am not convinced. Under which circumstaces can cynical arguments carry some weight? Which criteria and procedures guarantee that one finds those people in the world that are “worst off”? Moreover, isn’t it possible, according to your argument, that there might be only one single indvidual in the world who is “worst off”, and that to help groups or populations, as sick as they may be, is as wrong as helping the beggar next door? Since poverty shortens life expectancy in every case everywhere, is it plausible to prioritze children over elderly beggars? Under which conditions should the “worth” of people be measured and prioritized at all? Who should determine what “quality of life” is, and how do you compare it? Why didn’t you have a look at empirical work on reasons and effects of homelessness instead of listening to songs? Why don’t you consider other modes of helping people than “to drop a few coins”? Why do you think economic terminology is suitable at all to discuss this issue? Have you explained your point to homeless people? These are some question which came to my mind “upon reflection” on your reflection. The problem with these kinds of optimisations is that they rely on a mental and financial compartmentalisation that doesn’t make sense. You have to delineate personal indulgence money from money that you’re willing to give to charity, but if it is ethically sub optimal to give your charity money to a beggar, then what does that make the next few dollars you spend on an expensive coffee our practically anything non-essential? A long time ago, in Oxford as it happens, near where Walton Street meets Little Clarendon Street, before ATMs were ubiquitous, or at least before I had a card to use an ATM, there lurked a beggar called Pete. He had the commanding diction of a Shakespearean actor and would accost people with some story about a temporary misfortune that had put in the awkward position of having to ask to “borrow” a little change, which of course he never had available to repay when spotted a day or two later. But I and most of my friends found him amusing enough to give some change occasionally, for the performance if nothing else. One Sunday afternoon Pete jumped out at me and launched into the latest version of his speech. But this time I stopped him: I had only 35 pence in my pocket until the banks opened the next morning, and I was determined it wasn’t going to become Pete’s 35p. I explained this to him and said he’d be wasting his time on me today. He looked genuinely sorry, and immediately went into his jacket and pulled out a grubby but fat roll of notes (bills if you’re American). He proceeded to peel off and offer me several of them. I didn’t take them. Not sure what ethical lesson there is to draw from this, except perhaps that it’s easy to make unwarranted assumptions and thus to over-extend simple principles. –It is not the case that I will give to any charity the 50 cents I am saving on the beggar today. Rather, I will only be 50 cents richer. Similarly, I am not going to buy a car in one year if only I could stop spending 5 E each day in cigarettes. Ole Martin, (and Will, if he’s reading, and the 80khrs guys): imagine you had two potential recipients for your dollar. Alice is on $1.00 a day, facing severe poverty, environmental stress, etc. Bert is half a world away, in an identical situation except that he’s on $1.05 a day, and faces one less hideous disease. Your country has had nothing at all to do with Alice’s country, but has a history of colonial misrule in Bert’s country. To whom do you give? Alice has a marginally better call on your dollar if you really think history (and social context more generally) count for nothing. But real countries aid programmes favour Bert. Are they being immoral/irrational, or does history actually matter in these decisions? PS – Ole Martin- enjoyed your piece on Monbiot and Rand. Personally I think they’re both bonkers, but it was nice to see an academic stick up for the non-Guardian affiliated one. Sweden and Denmark both give more of their GNP to foreign aid than Britain or the US do. They’re not notably giving to their ex-colonies Finland and Iceland, and I think we can agree it would be silly to do so. Aid should go where it will help most. The US government gives disproportionately to the Middle East out of political rather than humanitarian interests. (http://humanosphere.kplu.org/tag/foreign-aid/) It looks like Britain gives disproportionately to India (http://www.guardian.co.uk/news/datablog/2011/apr/14/uk-aid-spending-history#data). I’m not a fan of either tactic – In short, I’d give the money to Alice if it will help her more than Bert, regardless of history. I don’t really see why efficiency should be the only principle in play here. Your position seems to argue that issues of distributional justice ought to play no role in aid. (Is that right?) This reminds me a bit of Nozick’s famous “Wilt Chamberlain example”, which he used to argue that liberty and pattern-based injunctions about income/wealth were incompatible. Nozick’s argument is critiqued from the political left who point out that the starting point – that of an initially just distribution – is counter-factual, and basically begs the central question. If transactions really were starting from a level playing field, Nozick would probably be right. But we start from a messy set of initial conditions, and that makes things more complex than in Nozick’s example. Similarly, I think if historical activities (and social context more broadly*) really didn’t matter, then I’d be inclined to agree that efficiency trumps everything else. But it seems to me that if it’s kind of unavoidably obvious that I’ve benefited (and Bert has suffered) from some set of historical arrangements where my “ancestors” (genetic or institutional) inflicted significant harms on Bert’s ancestors, then I ought at least to give that at least some weight when thinking about how I allocate my aid. *Including self-interest, repeated interaction, all that sort of thing. I agree that it’s unfair for Bert to suffer because of what our ancestors did to his. The question is, are we willing to let Alice suffer more than Bert in our attempts to even things out? It’s not her fault that Bert’s country has historical ties with mine. We seem to have different intuitions about proximity. I don’t think my responsibility to people varies based on their physical location. If giving is a justice thing, then it seems to me that Bert might feel aggrieved that Alice, too, is benefiting from the historical social arrangements that damaged his ancestor present and his prospects. It seems to me that a proper account of justice would factor that in. But if giving is beneficence alone Bert’s case seems much weaker, since whatever he’s owed comes from a different ledger (same wallet, though, so we’ll still have to settle up somehow – maybe he gets paid via the tax system and then Alice gets a smaller donation than she would have had my pre-tax income been higher). *I’d love to hear how the Giving What We Can/80k hours people feel about tax. Do tax regimes matter for your giving? If country X increased its aid budget and cut (say) its education budget, would you be inclined to give less if the govt gave on your behalf to your preferred recipients? Since you’re still giving the same amount/doing the same good, it’s just the means through which you give have changed. Yes, it’s beneficence (or a good outcome, as I usually think of it) rather than justice that I’m going for. I don’t have a theory that says why I want more happiness and less suffering – I think at that point it’s down to intuition. If your intuition is that art is worth more than reducing suffering, I wouldn’t say you had done anything wrong, but I’d say your intuition is quite different from mine. Then again, I’m not quite sure how to value well-being vs. absence of suffering, so I don’t think it’s cut and dry. I’m a member of Giving What We Can and 80,000 Hours, though not an organizer of either. I don’t consider tax stuff in my giving budget. If the government spends my taxes on good things, I consider it a nice bonus. If we’re talking about foreign aid, that’s only about 1% of taxes, so it would hardly make a dent even if I did decide to count it as part of my donations. If significant sums of my taxes were really going to my causes of choice, I’d still want to give from my post-tax income as well. My goal is to do as much good as possible, not to meet some minimum standard. I don’t fully live up to that ideal, but I do think it’s a good ideal to have. Sweden and Denmark are not notably giving to their ex-colonies Finland and Iceland, and I think we can agree it would be silly to do so. Aid should go where it will help most. The US government gives disproportionately to the Middle East out of political rather than humanitarian interests. (http://humanosphere.kplu.org/tag/foreign-aid/) It looks like Britain gives disproportionately to India (http://www.guardian.co.uk/news/datablog/2011/apr/14/uk-aid-spending-history#data) based on the history of colonization. I’m not a fan of either tactic – In short, I’d give the money to Alice if it will help her more than Bert, regardless of history. The only reason I could see for giving to Bert is if receiving aid from his former oppressor means so much to him that it would actually make him happier than it would make Alice. But I doubt Bert in India or Alice in Niger particularly care what foreign country their aid comes from. “Bono’s anti-poverty foundation ONE is under pressure to explain its finances after it was revealed that only a small percentage of money it raises reaches the needy. The non-profit organisation set up by the U2 frontman received almost £9.6million in donations in 2008 but handed out only £118,000 to good causes (1.2 per cent). The figures published by the New York Post also show that £5.1million went towards paying salaries. Now we know where the “ONE” comes from. In comparing Western beggars with poor people in the developing world, we shouldn’t conflate very different causes of poverty. The things that generally keep Western homeless people on the streets are addiction and mental illness – both very difficult to treat. Whereas the major barrier to the average poor person in Malawi is more likely to be malnutrition or disease, much easier to treat than mental illness. It’s much cheaper to improve the life of the average poor Malawian than the bag ladies of London. The old man in the song drinking lonely cups of tea is surely unhappy, perhaps as unhappy as a Malawian without enough to eat. But it’s not an unhappiness that will be helped by a vaccination or vitamin pill. Personally, I have a budget for the best charity I can find and a budget for fun stuff. I can donate to street people, etc. if I want, but it comes out of my fun budget and not my actual giving budget. This system works for me. Adrien Glauser on Should Religious Homophobia be a Firing Offence? Kathrin on ‘Now Is Not The Time’: Is It Wrong To Engage In Political Debate Following A Tragedy?